“A return to Dublin for the band after opening the main Hysteria world tour at the S.F.X. Hall in late August 1987. Vivian Campbell’s debut show with the band. His first live appearance since December 1991 in London with Shadow King and first major tour since the 1987/1988 Whitesnake tour. Vivian made some of his first ever live appearances in this venue with the band Sweet Savage, as did a certain band called U2. Download the full gig below. Thanks to wolfsbane for the upload. About halfway through tonight’s proceedings, Joe Elliott shook his head in disbelief: “I can’t believe it’s been four years since we’ve played onstage together!” Indeed, from the moment they began right up until they took the final bows one-and-a-half hours later, Def Leppard displayed an aggression and confident precision that belied this fact. If anything, the lengthy lay-off has made them hungrier than ever. This hush-hush performance in a small Dublin club – a warm-up for the ’7-Day Weekend 92/93′ tour – had a few surprises in store, the first of which was the arrival of Vivian Campbell on guitar. Although this gig took place before any official announcement was made, his appearance was not entirely unexpected. Popular with the crowd straight away, Joe’s request for a “welcome to the family” brought roars of approval which forced a coy smile from Vivian. His style blended in perfectly with the Leppard sound, and he also came across well alongside Phil Collen. The second surprise was the choice of material; the main set relied entirely upon the ‘Pyromania’ and ‘Hysteria’ albums, but given the strength of these songs (the mighty opener ‘Stagefright’, the epic ‘Gods of War’, ‘Die Hard The Hunter’ and the sublime pop of ‘Hysteria’) nobody could complain. The band may have thought that a set dominated by new songs would sacrifice some atmosphere, but instead it was the most crowd pleasing show I’ve ever witnessed. 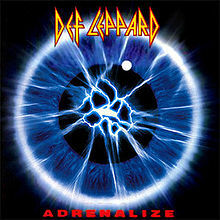 The only songs from ‘Adrenalize’ were the encores – ‘Let’s Get Rocked’ and ‘Tear it Down’. We’ll have to wait ’til June for the rest. As the band returned for their final encore. Joe was told the curfew had been broken. His response? “F*** Off! We’ll leave when we’re ready!” Then they launched into a faithful cover of Queen’s ‘Now I’m Here’, and all credit must go to Elliott for carrying the song with confidence and ease. Rick Allen’s performance during the heavier segments was also especially outstanding. As you’d expect, the thrust of the show was uptempo and good-time. Though there was one brief departure from this. It was a hushed crowd who listened to Joe talk of a lost friend. He seemed choked and at a loss for words. If it is at all possible, maybe Def Leppard can take comfort in their ability to overcome tragedy and produce something special. By building on past achievements and pushing forward, they are surely paying the best possible tribute.